Stealing music is typically a solitary enterprise, however there are occasions when it pays to have company. One urban composer -- we'll call him "Landini" -- had employed borrowed melodies in his tunes ever since he could pick up a nose flute. But he had only "borrowed" them. In Stravinsky's view -- and, indeed, in the minds of two reviewers who we will also call "Landini" -- that made him a lesser artist. So he aimed his sights higher: he would steal his next musical idea. He figured he could just race up to another composer, grab a motif, rhythm, fulmination or whatever, and dash off before his victim could react. The problem with his plan was that he was both smaller and much slower than his target tunesmith. So he persuaded another composer to help with the heist. Landini and his accomplice (who we'll also call Landini -- and what are the odds of that happening? ), concealed themselves along the berm of Tin Pan Alley. When their quarry strolled by, they leapt out, forced him to the ground, commandeered the melody he had been humming, and escaped with only a touch of brucellosis. Landini put the tune to use at once, and Landini the critic (i.e., the first one) later praised it for being "derivative." Turns out the victimized composer had lifted it from another composer, who had engaged in similar purloinical activities of his own ... on and on, all the way back to 1680 when Pachelbel's new pressure cooker malfunctioned. Before it blew up, it emitted eight piercing squeals, which would become, once the composer's writing hand mended, the two-measure ground bass to his D Major Canon. Today, musical larceny is easier than ever. Countless banal ideas exist as internettlesome wave files, endlessly lapping against the shores of the cyber sea, just begging to be filched. This very radio show has supplied its share of pinchable material over the years, so the attentive composer should already be preparing to download samples from the acoustic events soon to follow in the house. 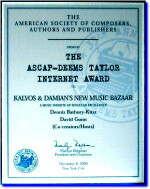 Of course, before there was a house, there was Kalvos ampersand Damian's New Music Bazaar. During its ten and a half-year existence, the proprietors interviewed scores of composers who attempted to be original, defying the very real needs of their audients. Many of them have since paid the price of their foolish vanity and are now dead -- or worse, living in a dingy Tulsa walk-up with a broken pressure cooker while earning minimum wage mucking out whale barns. It's you we're speaking to when we say stop trying to be so darned clever! Listen to Papa Igor. Go steal a nice tune, maybe add a Landini cadence to it. You’ll feel a lot better. As will your intended audients. Afterwards, you can boot up this chat with a tunesmith who has larsony on her mind, or at least in her name. Just be sure to wipe the ambergris off your boots before venturing in the house. * He mourns honestly who mourns without Muzak.